We’ve all been there before! Your students are looking at you with adorable but completely blank faces. You know you thoroughly taught the Make Ten addition facts (or some other skill) just last month or you totally trust that last year’s teacher covered this same material. Teaching these number combinations that equal ten was one of my biggest frustrations. After participating in numerous activities, my students would develop conceptual understanding and automaticity with these equations. Then, I would take the time to integrate learning this strategy with previously taught addition fact strategies. And we would move on to learning the next strategy. But soon enough, I would discover just how elusive their retention was of those Make Ten facts! Sometimes, the sufficient number of repetitions needed to ensure mastery is simply way more than we think it should be. I’m forever searching for new ways to engage students. The addition fact strategy game I’m sharing with you today was inspired by the heart dice game on Cul de sac Cool. This math game is perfect for kindergarten, first, and second grades. It provides built-in concrete and visual support for learning, reviewing, and retaining the Make Ten number combinations. Knowing these number combinations with automaticity makes adding 7, 8, or 9 to a number that much easier and builds a foundation for adding larger numbers. Fluency with the Make Ten facts is essential for understanding and applying the strategy of using or making a ten to add. This is a small group game. You need ten counters for each player. Place all the counters in the middle of the group in a container that enhances the theme. Each player places four counters on their ten frame and writes the corresponding Make Ten equation (4 + 6 = 10; four plus how many more makes ten) on their recording sheet. Players take turns rolling the die, matching the pips to the directions sheet, and following the directions to give or take counters. After each player’s turn, he/ she records the new equation. The object is to fill your ten frame with ten counters. 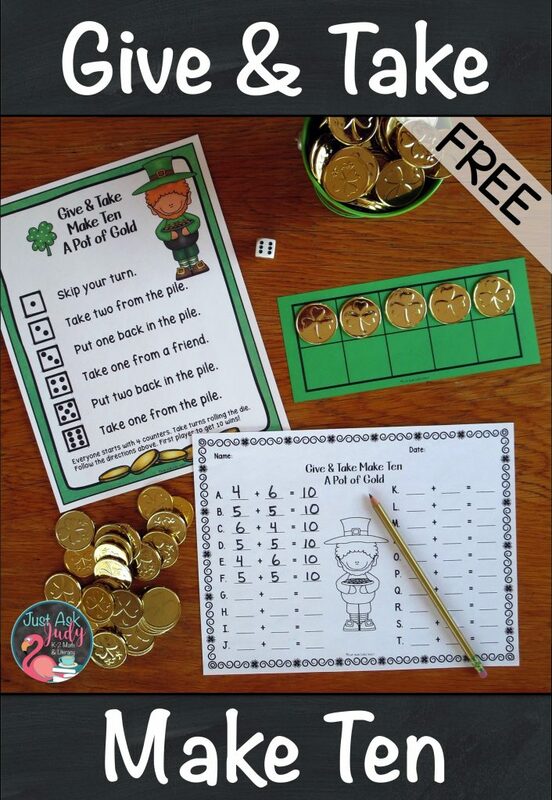 Click the highlighted words to download this free St. Patrick’s Day Give and Take Make Ten game from my Teachers Pay Teachers store. 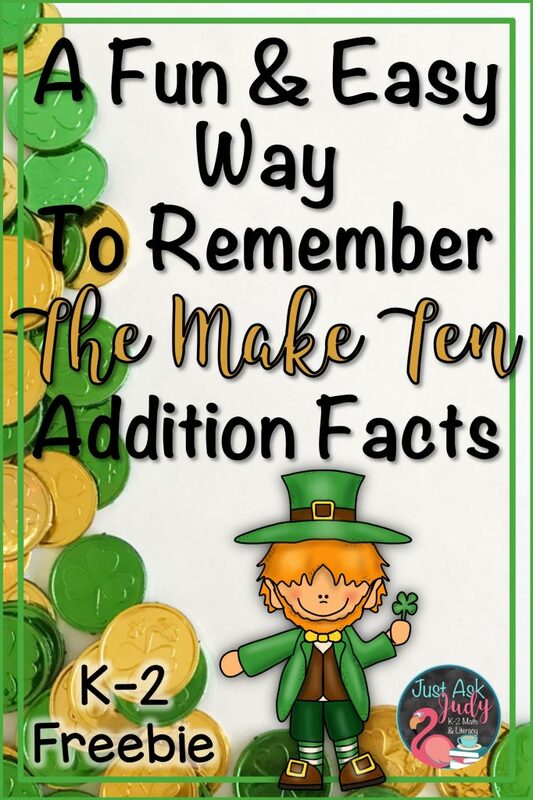 What is your favorite way to help your students retain the Make Ten addition facts? Comment below to share! Check out my seasonally themed spring, fall, and winter versions of Give & Take Make Ten, available for purchase separately or in a discounted bundle, to provide the repetition across time that may benefit some of your students. Each resource includes the same game in seven different themes. Take advantage! 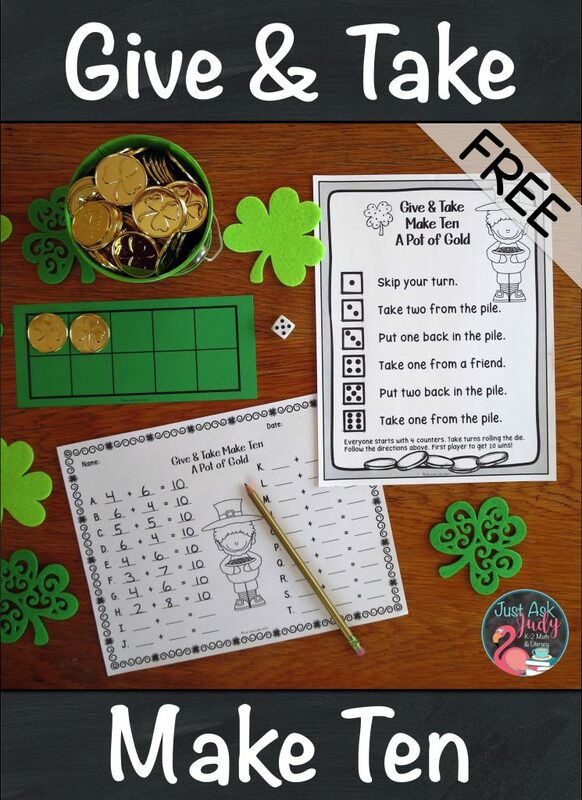 Read more blog posts and find additional freebies for teaching addition fact strategies. Stop by to visit the addition and subtraction section of my TpT store. Title photo by Jordan Dunagan.